At Child’s Play, each center is specifically designed with your child’s comfort and needs in mind. If you’re an interested family that wants to make the most of your child’s life, we invite both you and your child to see firsthand what Child’s Play has to offer. Both the tour of our center and the initial consultation are free to prospective families. During your visit, you will meet one-on-one with a certified staff member and have the opportunity to ask any questions that you may have regarding our process. We will then take you on a guided tour and describe what your child’s day may look like with us. It is of note that until we get to know your needs and perform an assessment, this typical day is very generally presented. Your child is our main priority, and we want you to feel safe and confident that they will have the full attention they deserve. Want to get started? Start planning your first visit by entering your information to the right. One of our staff members will then contact you to confirm your appointment. Together, we can make the most of your child’s life. Better care is just the beginning. If possible, having the following information is very helpful during a first meeting to ensure we provide you with the most accurate information. Depending on what you have available, recommendations can be made to acquire needed items. 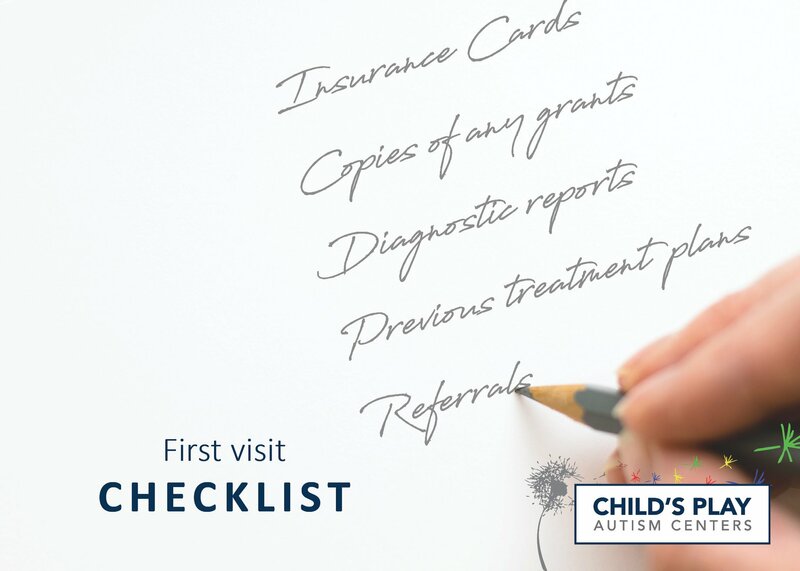 Include any insurance that may be available to your child, such as additional parent and step-parent policies. Benefits vary greatly! Lots of questions. We like these! How long ago was your child's last Dr. visit? **Child's Play Jefferson Park will begin operations in early 2019. Clients may enter into services at either of Child's Play's other locations, with the expectation of transferring to Jefferson park if it better suits your child's needs upon opening. They are amazing!! So happy that there is a place for my daughter to go and be challenged to meet her potential! !